We are home...! What a summer! I was thinking about it today and we've lived more than 3 out of the last 5 weeks out of a suitcase, have travelled to another country and have seen some of the most beautiful sights. It's been a wonderful time for us as a family. A lot of time together, which can be both great and challenging (wink!). One of my hopes for my children has always been that they will not only have a sibling relationship but also be friends, and this summer they've again had a great time together. And in just 10 days school will be starting for them. Though the summer has gone fast, I think we're all ready for a little more routine. 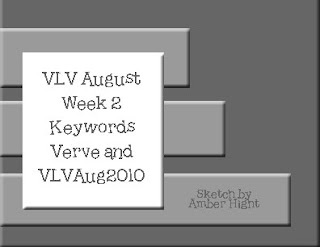 I started with the fun little set from Verve, Enjoy Today Plain Jane. I colored it with Copic Markers and then tried to recreate the feeling and texture of worn denim, so I used my blender pen to lift up some of the color doing both horizontal and vertical lines. 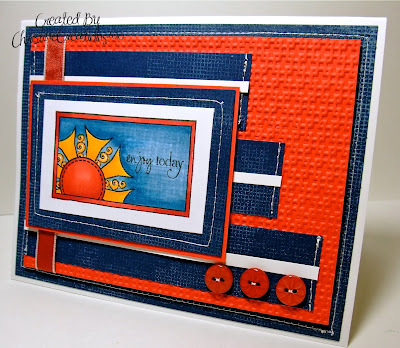 I stamped on all the navy layers with the SU Canvas background set to give it more of the feel of denim and stitched on the layers just like the bed skirting. Then I created texture to match the headboard in the Poppy layer. And if you look at the inspiration photo you'll see some touches of yellow - so that's the yellow in the sun beams. Here it is tipped the other direction. It might be the card for my brother, who's birthday is this week. Think it's masculine enough? I tried not to make it too fussy in the details. Thanks for dropping by today :) Hopefully I'll be back to a more regular schedule of creating too! Recipe: Stamps: Verve - Enjoy Today Plain Jane, SU - Canvas Background; Ink: Memento Tuxedo Black, Craft White; Paper: Whisper White, Night of Navy, Poppy Parade, Flourishes Classic White; Accessories: Copic Markers, Blender Pen, Sewing Machine, Buttons, White Gel Pen, Taffeta Ribbon, Big Shot, Lattice Embossing Folder. Christine, that's gorgeous! I LOVE the colors you used and the Jeans look you achieved with your copics. Great card. 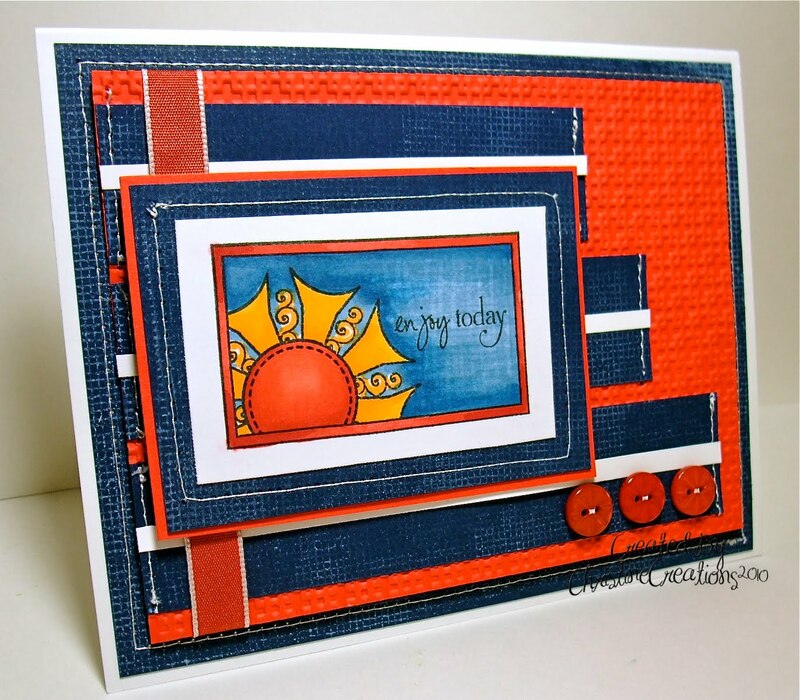 Love this charming, happy card Christine!! The denim look and texture is fantastic!! How awesome that you have so many treasured family memories this summer!! What a blessing!! HUGS!! Darling use of the insp. picture and the sketch, Christine. Great denin look too. Great look! So bold and beautiful! Great job. I love all the texture you have on this card, awesome! This is TOTALLY awesome Christine! LOVE the look of jeans you achieved...that is SO cool! You totally rock the masculine cards and this is no exception!! Wowwwww, the texture on this is amazing!! Glad you've all had such a wonderful summer together. We have one more week 'til the little one starts kindergarten, so I'm going to enjoy this week as much as I can. I just love summer and I'm not ready for it to end. This is beautiful, Christine! I love the colors and layout. Sounds like you had fun on your vacation.